For other uses, see Gaucho (disambiguation). A gaucho (Spanish: [ˈɡautʃo]) or gaúcho (Portuguese: [ɡaˈuʃu]) is a skilled horseman, reputed to be brave and unruly. The gaucho is a national symbol in Argentina and Uruguay, but is also a strong culture in the far south region of Brazil. Gauchos became greatly admired and renowned in legends, folklore and literature and became an important part of their regional cultural tradition. Beginning late in the 19th century, after the heyday of the gauchos, they were celebrated by South American writers. 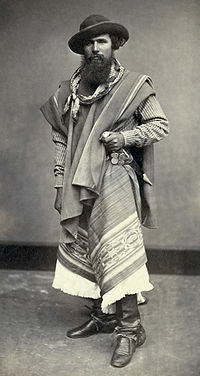 The gaucho in some respects resembled members of other nineteenth century rural, horse-based cultures such as the North American cowboy (vaquero in Spanish), the Chilean huaso, the Peruvian chalan or morochuco, the Venezuelan or Colombian llanero, the Hawaiian paniolo, the Mexican charro or the Portuguese campino. According to the Diccionario de la lengua española, in its historical sense a gaucho was "a mestizo who, in the 18th and 19th centuries, inhabited Argentina, Uruguay, and Rio Grande do Sul in Brazil, was a migratory horseman, and adept in cattle work" In Argentina and Uruguay today a gaucho is, according to the same source, simply "A country person, experienced in traditional livestock farming". Because historical gauchos were reputed to be brave, if unruly, the word is also applied metaphorically to mean "Noble, brave and generous", but also "One who is skilful in subtle tricks, crafty". In Portuguese the word gaúcho (note the accent) means "An inhabitant of the plains of Rio Grande do Sul or the pampas of Argentina descended from European man and [Amer]indian woman who devotes himself to lassoing and raising cattle and horses"; and in Brazil gaúcho has also acquired a metonymic signification, meaning anyone, even an urban dweller, who is a citizen of the State of Rio Grande do Sul. In its purest sense, gaucho referred to the nomadic, often outlaw inhabitants of the great plains of Argentina, Uruguay and Brazil. In current usage, gaucho usually designates the rural working class in general." There are several hypotheses concerning the origin of the term. It may derive from the Spanish term chaucho, in turn derived from a Turkish low-rank military term Chiaus (çavuş), through Arabic shawsh which became broadly applied to any guard/watcher or aide. The first recorded use of the term dates to Argentine independence in 1816. Another scenario indicates the word may derive from the Portuguese gaudério, which was designated to the inhabitants of the vast regions of Rio Grande do Sul and Río de la Plata in the 18th century or the Portuguese garrucho that points to an instrument used by the gauchos to trap and hamstring cattle. The 18th century chronicler Alonso Carrió de la Vandera speaks of gauderios when it mentions the gauchos or huasos as poorly dressed men. Another plausible origin is from a South American indigenous language, such as Mapudungun cauchu ("vagrant", "wanderer"), kauču ("friend"), or Quechua wahcha ("vagabond", "poor person"). It could also derive from Arabic وحشة wahcha, which means the state of being lonely in the wilderness. An essential attribute of a gaucho was that he was a skilled horseman. "He has taken his first lessons in riding before he is well able to walk". Without a horse the gaucho felt himself unmanned. The naturalist William Henry Hudson (who was born on the pampas of Buenos Aires province) recorded that the gauchos of his childhood used to say that a man without a horse was a man without legs. He described meeting a blind gaucho who was obliged to beg for his food yet behaved with dignity and went about on horseback. Richard W. Slatta, the author of a scholarly work about gauchos,[a] notes that the gaucho used horses to collect, mark, drive or tame cattle, to draw fishing nets, to hunt ostriches, to snare partridges, to draw well water, and even − with the help of his friends − to ride to his own burial. By reputation the quintessential gaucho caudillo Juan Manuel de Rosas could throw his hat on the ground and scoop it up while galloping his horse, without touching the saddle with his hand. For the gaucho, the horse was absolutely essential to his survival for, said Hudson: "he must every day traverse vast distances, see quickly, judge rapidly, be ready at all times to encounter hunger and fatigue, violent changes of temperature, great and sudden perils". mi mujer que no me hace falta. For I don't need my woman. The gaucho, from the poorest worker on horseback to the largest owner of lands and cattle, has, or had in those days, a fancy for having all his riding-horses of one colour. Every man as a rule had his tropilla — his own half a dozen or a dozen or more saddle-horses, and he would have them all as nearly alike as possible, so that one man had chestnuts, another browns, bays, silver- or iron-greys, duns, fawns, cream-noses, or blacks, or whites, or piebalds. The gaucho plays an important symbolic role in the nationalist feelings of this region, especially that of Argentina, Paraguay, and Uruguay. The epic poem Martín Fierro by José Hernández (considered by some the national epic of Argentina) used the gaucho as a symbol against corruption and of Argentine national tradition, pitted against Europeanising tendencies. Martín Fierro, the hero of the poem, is drafted into the Argentine military for a border war, deserts, and becomes an outlaw and fugitive. The image of the free gaucho is often contrasted to the slaves who worked the northern Brazilian lands. Further literary descriptions are found in Ricardo Güiraldes' Don Segundo Sombra. Like the North American cowboys, as discussed in Richard W. Slatta, Cowboys of the Americas, gauchos were generally reputed to be strong, honest, silent types, but proud and capable of violence when provoked. The gaucho tendency to violence over petty matters is also recognized as a typical trait. Gauchos' use of the famous "facón" (large knife generally tucked into the rear of the gaucho sash) is legendary, often associated with considerable bloodletting. Historically, the facón was typically the only eating instrument that a gaucho carried. The gaucho diet was composed almost entirely of beef while on the range, supplemented by yerba mate (erva-mate in Portuguese), an herbal infusion made from the leaves of a South American tree, a type of holly rich in caffeine and nutrients. Gauchos dressed quite distinctly from North American cowboys, and used bolas or boleadoras - in Portuguese boleadeiras - (three leather bound rocks tied together with approximately three feet long leather straps) in addition to the familiar "North American" lariat or riata. The typical gaucho outfit would include a poncho (which doubled as a saddle blanket and as sleeping gear), a facón (large knife), a rebenque (leather whip), and loose-fitting trousers called bombachas, belted with a tirador, or a chiripá, a loincloth. During winters, gauchos wore heavy wool ponchos to protect against cold. Their tasks were basically to move the cattle between grazing fields, or to market sites such as the port of Buenos Aires. The yerra consists of branding the animal with the owner’s sign. The taming of animals was another of their usual activities. Taming was a trade especially appreciated throughout Argentina and competitions to domesticate wild foal remained in force at festivals. The majority of Gauchos were illiterate and considered as countrymen. Gaúcho is also the common denomination of the current inhabitants of the Brazilian State of Rio Grande do Sul. Gauchito (a boy in the Argentine colors and a gaucho hat) was the mascot for the 1978 FIFA World Cup. Martín Fierro is a 2,316-line epic poem by the Argentine writer José Hernández on the life of the eponymous gaucho. Way of a Gaucho 1952 film starring Gene Tierney and Rory Calhoun. The Gaucho was a 1927 film starring Douglas Fairbanks. La Guerra Gaucha was a 1942 Argentine film set during the Gaucho war against Spanish royalists in Salta, northern Argentina, in 1817. It is considered a classic of Argentine cinema. The third segment of Disney's 1942 animated feature package film, Saludos Amigos, is titled "El Gaucho Goofy", where American cowboy Goofy gets taken mysteriously to the Argentine pampas to learn the ways of the native gaucho. Gaucho is the name of the 1980 album by American jazz fusion band Steely Dan, which featured a song by the same name. Gauchos of El Dorado was a 1941 American Western "Three Mesquiteers" B-movie directed by Lester Orlebeck. Inodoro Pereyra by Roberto Fontanarrosa is an Argentinean humor comics series about a gaucho. Gaucho is the name of a song by the Dave Matthews Band on the 2012 album Away From the World. The Gaucho is the University of California Santa Barbara mascot. Gaucho in authentic clothing, 1840s. Argentine Pampas gauchos training for the Esgrima Criolla. Un alto en el campo (1861) by Prilidiano Pueyrredon. La Posta de San Luis by Juan León Pallière (1858). Two gauchos in Buenos Aires, Argentina, in 1880. Folklore dance: Zamba, Argentina. Gaucho. Emperor Pedro II of Brazil in typical Gaúcho outfit. Gauchos in Corrientes province, Argentina. Brazilian gaúcho with typical clothing at the 2006 Farroupilha Parade. Argentine gauchos in the city of Salta. Gauchos in the Federalist Revolution (1893 to 1895). ^ The work has been peer-reviewed by Adelman, 1993; Collier, 1988; Lynch, 1984; Reber, 1984. ^ Slatta, Auld and Melrose. ^ Dictionary of the Royal Spanish Academy, Tri-Centennial Edition, Gaucho, sense 5. ("Mestizo que, en los siglos XVIII y XIX, habitaba la Argentina, Uruguay y Río Grande del Sur, en Brasil, era jinete transhumante y diestro en los trabajos ganaderos.") accessed 4 February 2017. ^ Dictionary of the Royal Spanish Academy, Gaucho, sense 6. ^ Dictionary of the Royal Spanish Academy, Gaucho, sense 1. ^ Dictionary of the Royal Spanish Academy, Gaucho, sense 4. ^ Dicionário Priberam da Língua Portuguesa, Gaúcho. ^ Oliven, Ruben George (2000). ""The Largest Popular Culture Movement in the Western World": Intellectuals and Gaúcho Traditionalism in Brazil". American Ethnologist. Wiley for the American Anthropological Association. 27 (1): 128–146. doi:10.1525/ae.2000.27.1.128. JSTOR 647129. , p.129. ^ This is rather an implausible origin given that in Spanish loanwords from Arabic, the gau is often a transformation from the Arabic letter waw (W). ^ Hudson, 1918, p. 23. ^ Hudson, 1918, p. 24. ^ Cunninghame Graham, 1914, p. 5. ^ Hudson, 1895, p. 356. ^ Arnoldi and Hernández, p. 177. ^ Hudson, 1918, p. 160. ^ Gauchos and Foreigners : Glossing Culture and Identity in the Argentine Countryside. ^ "El gaucho en Uruguay y su contribución a la literatura". Adelman, Jeremy (May 1993). "Review". Journal of Latin American Studies. Cambridge University Press. 25 (2): 401–402. doi:10.1017/S0022216X0000482X. JSTOR 158174. Arnoldi, Henry; Hernández, Isabel (1986). Amor tirano: antología del cancionero tradicional amoroso de Argentina. Ediciones del Sol. ISBN 9789509413030. Assunção, Fernando O. (2006). Historia del gaucho (in Spanish). Claridad. ISBN 978-950-620-205-7. Assunção, Fernando O. (1997). Pilchas criollas (in Spanish). Emecé. ISBN 978-950-04-1121-9. Christison, David (1882). "The Gauchos of San Jorge, Central Uruguay". The Journal of the Anthropological Institute of Great Britain and Ireland. Royal Anthropological Institute of Great Britain and Ireland. 11: 34–52. doi:10.2307/2841497. JSTOR 2841497. Collier, Simon (May 1998). "Review". Journal of Latin American Studies. Cambridge University Press. 20 (1): 208–210. Cunninghame Graham, Robert Bontine (1914). El Río de la Plata (in Spanish). Londres: Wertheimer, Lea y Cía. Hudson, William Henry (1895). The Naturalist in La Plata. London: Chapman & Hall. Hudson, William Henry (1918). Far Away and Long Ago: A History of My Early Life. New York: E.P. Dutton and Company. Lynch, John (August 1984). "Review". The Hispanic American Historical Review. Duke University Press. 64 (3): 586–587. doi:10.2307/2514963. JSTOR 2514963. Oliven, Ruben George (2000). ""The Largest Popular Culture Movement in the Western World": Intellectuals and Gaúcho Traditionalism in Brazil". American Ethnologist. Wiley for the American Anthropological Association. 21 (1): 128–146. doi:10.1525/ae.2000.27.1.128. JSTOR 647129. Reber, Vera Blinn (July 1984). "Review". The Americas. Cambridge University Press. 41 (1): 140–141. doi:10.2307/1006958. JSTOR 1006958. Sarmiento, Domingo Faustino (2008). El chacho. Lingkua Digital. ISBN 9788498973518. Slatta, Richard W. (1992). Gauchos & the Vanishing Frontier. Lincoln and London: University of Nebraska Press. ISBN 978-0-8032-9215-4. Slatta, Richard W.; Auld, Ku'ulani; Melrose, Maile (2004). "Cradle of Hawai'i's Paniolo". Montana: The Magazine of Western History. Montana Historical Society. 54 (2): 2–19. JSTOR 4520605. Shumway, Nicolas (1993). The Invention of Argentina. Berkeley; Los Angeles; London: University of California Press. ISBN 978-0-520-08284-7. Wikimedia Commons has media related to Gauchos.